Friend, Our Legend premieres June 27 · K-POPPED! Friend, we’ve gotta make this drama a hit! 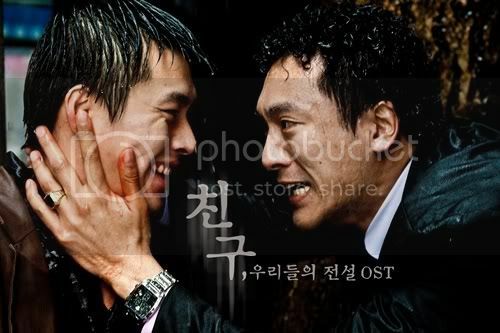 New stills for Hyun Bin and Kim Min-joon‘s drama Friend, Our Legend has been released. The drama is a remake of the 2001 hit movie “Friend”, and is also directed by the same director of the movie, Kwak Kyung Taek. Anticipation for the drama is rising as new stills are released and many who are fans of the movie are pleased at the similar feel of the drama. This will be a 100% pre-produced drama, which means all episodes have been filmed before it starts airing. The cast and crew worked almost every day for four months in Busan, where the drama was filmed. Kim Min-jung, who’s a native of Busan had no problems with the dialect, but Hyun Bin had to practice hard to get the thick southern accent down pat. 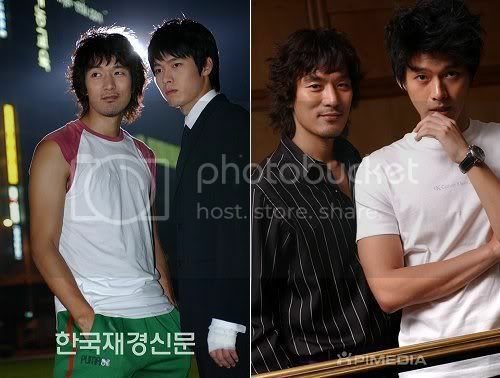 Both Hyun Bin and Kim Min-joon are working together for the second time in this drama. They were both in the 2004 drama Ireland together. Friend, Our Legend will air on June 27, 2009 on MBC. @alchocoholic Thanks for the heads up! Corrected it!!! Anyways, I can't wait for this since I loved the movie! Wonder how 16 (20?) episodes will hold up against a 2-hour film and a classic one at that. Hope it won't turn out the way Tazza did!